Sciapod protecting himself from the sun by the shade of his foot. In margin of "Heures à l'usage des Antonins", 15th century. Attributed to the "Maître du Prince de Piémont". Monopods (also sciapods, skiapods, skiapodes) are mythological dwarf-like creatures with a single, large foot extending from a leg centered in the middle of their bodies. The names monopod and skiapod (σκιάποδες) are both Greek, respectively meaning "one-foot" and "shadow-foot". He [Ctesias] speaks also of another race of men, who are known as Monocoli, who have only one leg, but are able to leap with surprising agility. The same people are also called Sciapodae, because they are in the habit of lying on their backs, during the time of the extreme heat, and protect themselves from the sun by the shade of their feet. Philostratus mentions Skiapodes in his Life of Apollonius of Tyana, which was cited by Eusebius in his Treatise Against Hierocles. Apollonius of Tyana believes the Skiapodes live in India and Ethiopia, and asks the Indian sage Iarkhas about their existence. St. Augustine (354–430) mentions the "Skiopodes" in The City of God, Book 16, chapter 8 entitled, "Whether Certain Monstrous Races of Men Are Derived From the Stock of Adam or Noah's Sons." and mentions that it is uncertain, whatever such creatures exist. The race of Sciopodes are said to live in Ethiopia; they have only one leg, and are wonderfully speedy. The Greeks call them σκιαπόδεϛ ("shade-footed ones") because when it is hot they lie on their backs on the ground and are shaded by the great size of their feet. The Hereford Mappa Mundi, drawn c. 1300, shows a sciapod on one side of the world, as does a world map drawn by Beatus of Liébana (c. 730 – c. 800). According to Carl A. P. Ruck, the Monopods's cited existence in India refers to the Vedic Aja Ekapad ("Not-born Single-foot"), an epithet for Soma. 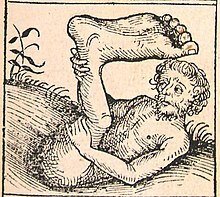 Since Soma is a botanical deity the single foot would represent the stem of an entheogenic plant or fungus. The truth is that no such people do exist as nations, though there may be an individual monster here and there. Nor is there any people at all such as has been invented, who have but one foot which they use to shade themselves withal. But as all the Indians commonly go naked, they are in the habit of carrying a thing like a little tent-roof on a cane handle, which they open out at will as a protection against sun or rain. This they call a chatyr; I brought one to Florence with me. And this it is which the poets have converted into a foot. C.S. Lewis introduces monopods in the book The Voyage of the Dawn Treader, a part of his children's series The Chronicles of Narnia. In the story, a tribe of foolish dwarves known as Duffers inhabit a small island near the edge of the Narnian world along with a magician named Coriakin, who has transformed them into monopods as a punishment. They have become so unhappy with their appearance that they have made themselves invisible. They are (re)discovered by explorers from the Narnian ship, the Dawn Treader, which has landed on the island to rest and resupply, and at their request Lucy Pevensie makes them visible again. Through confusion between their old name, "Duffers", and their new name of "Monopods", they become known as the "Dufflepuds". According to Brian Sibley's book The Land of Narnia, Lewis may have based their appearance on drawings from the Hereford Mappa Mundi. Umberto Eco in his novel Baudolino describes a sciapod named Gavagai. The name of the creature "Gavagai" is a reference to Quine's example of indeterminacy of translation. ^ Barney, Stephen A. et al (translators) (2006). The Etymologies of Isidore of Seville. Cambridge University Press. p. 245. ^ "The Hereford Mappamundi". Retrieved 14 June 2014. ^ Beato del Burgo de Osma (c. 750–800). Hereford Mappa Mundi. Folios 34v-35. ^ "Mushrooms and philosophers", Journal of Ethnopharmacology. ^ Yule, Sir Henry (1913). Cathay and the way thither: being a collection of medieval notices of China VOL. II. London: The Hakluyt Society. p. 257. ^ Lewis, C.S. (1965) . The Voyage of the Dawn Treader. Puffin. pp. 114–124, 139–147. Wikimedia Commons has media related to Sciapod. This page was last edited on 30 March 2019, at 15:55 (UTC).